A disappointing Planning Commission staff report made its way to my email inbox the other day. Despite months of public meetings where Stockton residents expressed consistent and overwhelming support for focusing efforts on improving existing neighborhoods within the city, a recently released Planning Commission agenda outlines potential neighborhood centers in parts of the city that aren’t even planned for development. 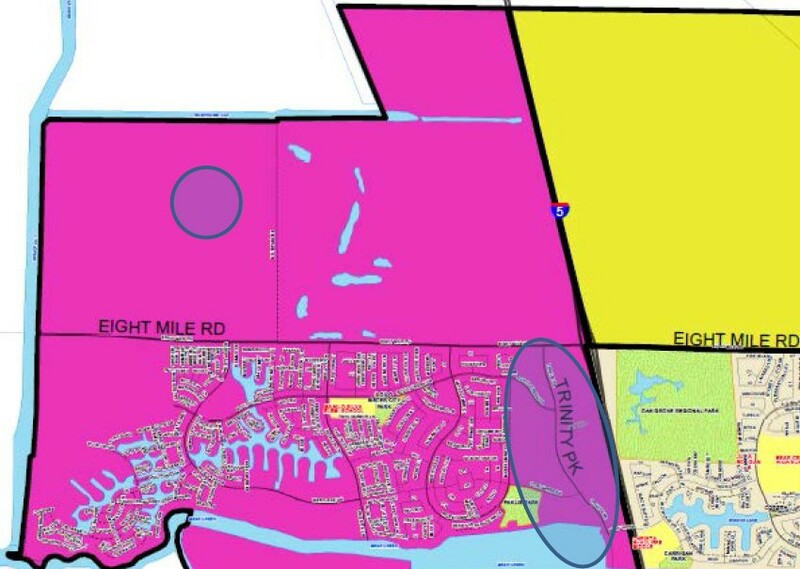 This follows a previous SCL article in which criticism was doled out regarding new neighborhood maps that were put forward after an engaging public meeting. 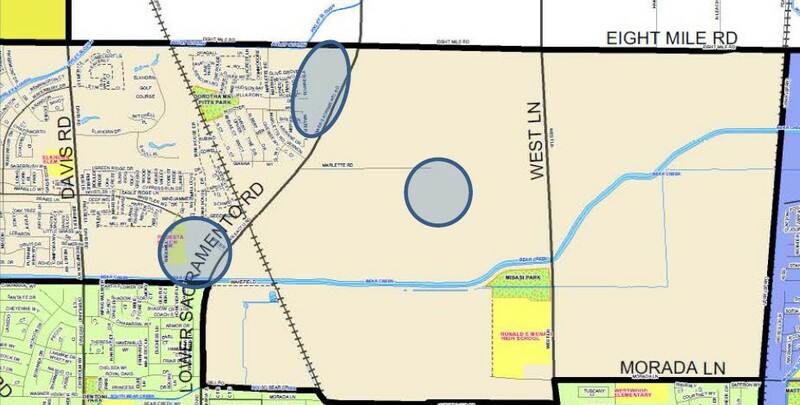 These draft maps included northern areas of the city – noted as “potential” areas for development by planning commissioners – as actual neighborhoods, which ran counter to public opinion expressed at previous meetings. This new document continues that trend. The report uses the existing draft neighborhood map to propose the exact location of potential neighborhood centers. These centers are intended to act as the main commercial and social hub of each distinct community. Ideally, a neighborhood would be self-sustaining and include all the services one needs in order to live their day-to-day life – a grocer that carries staples, perhaps a small financial institution, adequate transit access, a place or two to eat, some retail, etc. After decades of planning for cars instead of people, sentiment has clearly turned, evident at every public general plan meeting held to date where Stocktonians have voiced their preference for focusing development within existing city limits. Goals city staff have outlined – reducing vehicle miles traveled and creating more livable communities – will not be reached by continuing to accommodate fringe growth, no matter how it’s dressed up or what language is used to describe it. Expanding city limits poses many potential problems for the city. Who will deliver public services and infrastructure out to these areas? Who will pay for that delivery? What about existing areas like south-side that suffer from decades of disinvestment? Who are we planning for? Residents? Outside developers? Can our existing public transit system even service these areas? Planning Commissioners have also elected to include Bear Creek East as an established neighborhood, even though this development was rejected by the same commission members earlier this year. infill development. As the younger population waits longer to have children and the other end of the population ages, large single-family homes are falling out of favor. Development in Stockton needs to meet the projected market and northward growth does not address future needs. Wasn’t that the impetus of this general plan update – to move away from this exact type of fringe development and reign in the city’s physical footprint? These are questions that should be put to each planning commissioner. We should be asking our public officials about the comments we made as citizens at previous meetings and why these northern portions (some not even currently within city limits) are being given equal weighting to what we, as the public, emphasized as our priorities – focusing growth within city limits and expanding services to existing communities. Change is indeed difficult, but our city is on the precipice of a huge opportunity to start developing sustainably and begin attracting real investment. This opportunity will be wasted if we continue to allow room for sprawling, fringe development. Please voice your concerns and thoughts by attending this Thursday’s (Dec. 11) Planning Commission meeting at 6 p.m. in the City Council Chambers at 425 N. El Dorado Street. Planning Commissioners make these kind of wrong headed decisions because the City Council neglected to set policy. Particularly disappointing post bankruptcy as we are a broke city in desperate need of good planning, infill, and adaptive reuse. Show up at Planning and demand infill; no more bad bankruptcy inducing decisions. And no more hiring of City employees because our city is too large to govern. Well, obviously the Planning Commission officials suffer from “acute amnestic syndrome” (AAS). But won’t there be government penalties levied against the City of Stockton, like overlooked federal grants and funding, or more Sierra Club lawsuits, or even a SJC lawsuit since this direction is antipodally counter to the Strong Cities, Strong Communities (SC2) and the SJC Board of Supervisors’ decision to preserve farmland in the General Plan? I don’t think Stockton’s precarious financial situation can afford any more of these types of complicating litigations that thwart the city’s development and detour its progress. If Stockton is going to expand, the most logical expansion direction is EAST and SOUTH, NOT north. An eastern expansion of new neighborhoods east of the 99 Golden State Freeway would actually bring a larger population presence and better convenient access in closer proximity to downtown (only a 4.5-mile displacement from downtown), rather than more new extreme northern neighborhoods further removed away from downtown (a nearly 13-mile displacement from downtown). The Planning Commission needs to get out an ordinary school ruler and a map of Stockton and note these glaring drastic differences to see that northern expansion will further diffuse the city infrastructure and increase carbon emissions due to cars in the far flung neighborhoods needing to be on streets longer to get to their destinations and access other city amenities, medical, institutes, municipal government agencies, shopping and employment located miles away. And the Planning Commission’s so-called ‘vision’ to transform the entire 8-Mile Road, a major east-west thoroughfare boulevard, into miles of backyard brick fences of dreary and mundane tract homes is just utterly horrific. What a complete and total waste and boring eyesore that will be. If these northern areas are developed then policy regulations imposed must stipulate MANDATORY medium residential mid-rises to high density residential towers with vast and expansive PUBLIC greenbelts, parks/lakes, gardens, recreational amenities, bike routes and jogging/walking trails integrated in between, NOT land-hogging sardine-packed tract homes (like the catastrophic design and layout of hideous Weston Ranch); and satellite commercial retail and business centers or mixed-use developments must be strategically incorporated. And not the city, but the developers must pay for streetscaping and landscaping of the entire Eight Mile Road Corridor and its conversion to a public oriented complete street with attention to transit and biking features. Furthermore, there has to be a new policy instituted for developers to develop X-amount of square footage of downtown urban infill per X-amount of square footage they develop at the city’s fringes. This must be a mandatory policy imposed. The Eight Mile Road Corridor needs to be a commercial boulevard lined with dense mixed-use residential, business, institute, hostelry and retail, not a street of the backs of single family dwellings and backyard fencing. For God’s sake, has the Planning Commission lost their minds? This return to “business as usual” is a travesty of good city planning. If you look at times such as the great depression when cities would grow they became stronger the ones that did not became weaker . I believe we need to let Stockton city limits grow without growth is death to a city it’s size but also we need to work on the inside of Stockton to if we fail on one we fail on both they both have to be done done at the same time . It’s time for stocktonians to face the facts Stockton is a city not a town without growth for a city it’s size and also working on the inside of the city it will do bad they both need to be done now not later.